For my last impossible object I built a Penrose triangle that was not symmetric (wit 2 strait sides and a twisted one). 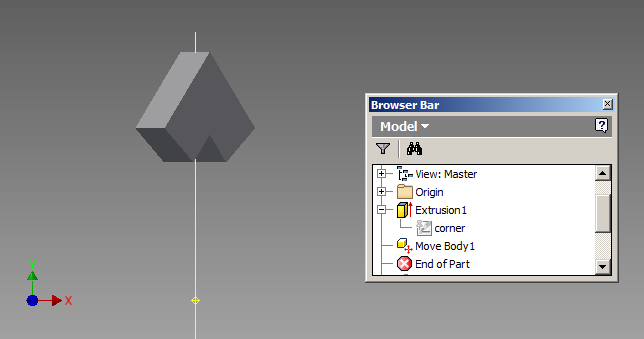 In this post I will try to build a symmetric object, using a few more techniques with Inventor. Getting the best visual result requires to tweak the geometry of the final object so my first step was to create 5 user parameters that will be used to build the triangle. I then proceed to build a sketch of one corner of the triangle. Only the left side was drawn (with 2 orthogonal constraints in red). The right side is only a symmetry relative to the Y axis. 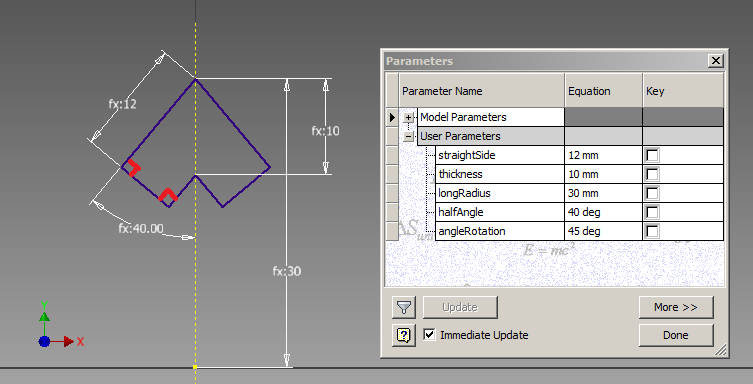 The second step is to extrude the profile on both side by thickness/2, then use the move body tool to rotate the result by “angleRotation” through the Y axis. Then use the circular pattern to create 3 copies of the corner. I had to use the “pattern a solid” option otherwise the default “pattern a feature” was copying the corner without the step 2 rotation. Create a loft can be created between the two side faces of the top and left corner, then this loft can be “circular patterned” to complete the triangle structure. The result needs to be smoothed on the junctions to make it less obvious. Select the 24 edges around with a 10mm radius fillet to finish the triangle. The final shape result is more pleasing than my first attempt to build a penrose triangle. More parameters could help the getting a better final shape, but would increase the instruction complexity so I’ve chosen to keep it simple. The STL file is available on Thingiverse here, the Inventor part file is here. This entry was posted in Uncategorized on April 8, 2013 by damienideas.